Traditional booster programs put your business in programs or calendars with extremely limited circulation and little return for your business. At 8to18 Media we have created a better way! Capitalizing on the reach and traffic of our Athletics2000 network, we have created an online advertising opportunity that is hard to beat by other advertising mediums. Not only does your business get noticed, but you also benefit from goodwill within the local community. Athletics2000 websites are the “go-to” place within the community for the most up-to-date information on all things extra-curricular at the local schools. By placing your business on our site you will not only support the local schools, but your business will benefit from the high traffic and top-of-mind awareness our network can provide. It is a "WIN-WIN" situation for both the school and your business. Questions or ready to find out more? With all of the options available to advertise your business, how do you decide which is the best for your business? The Answer is ONLINE ADVERTISING! Online advertising is proven to be more cost effective than other mediums that you are currently utilizing to reach your target consumer. 8to18 Media & Athletics2000 operates high school athletics and activities web sites in the greater Chicago Metropolitan Area. Our target audience consists of parents with students between the ages of 11 to 18 who are involved in high school and middle school sports and activities. Your local high school(s) is already part of our network, giving you instant access to your target audience. 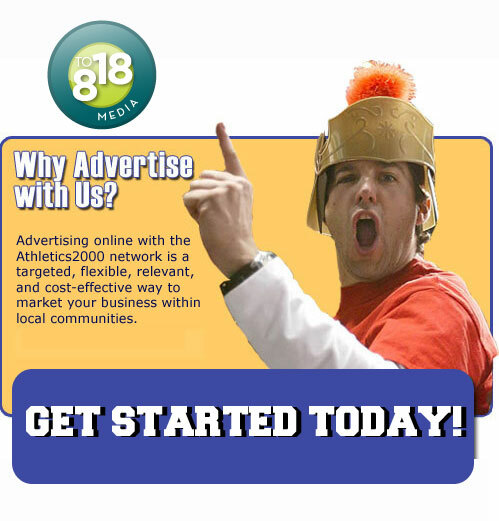 At 8to18 Media we provide a targeted, flexible, trackable, and cost-effective way to market your business to your local community while at the same time supporting the local schools. Online advertising on Athletics2000 is highly flexible. We offer different sizes and placement options. Our advertising rates are based upon the amount of exposure that your ad receives. You can select as few as one site to as many as all of the available sites on our network, with the same ad across the network for broad reach, to a unique ad for every individual school if you so desired. We would be happy to work with you to customize your ad to meet your specific online marketing objectives, taking advantage of our experience and data from working with hundreds of other local advertisers across our network. Athletics2000 is not responsible for the content or availability of any internet sites external to Athletics2000. Pictures and articles are the property and responsibilty of the host schools and their associations.